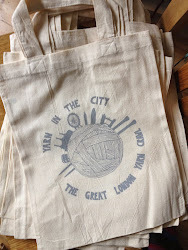 Yarn in the City: The Great London Yarn Crawl: Ch-ch-changes! You asked, we answered! What's new for 2014! Ch-ch-changes! You asked, we answered! What's new for 2014! June is upon us, and it's time to start updating you on all the exciting things we have in store for this year's edition of the GLYC! There are a bunch of changes upcoming, so let's get right into the details. You asked for more shops, and we are thrilled to say that we've found some great ones to add to the GLYC line-up. We're expanding into zone 4 this year with four new shops joining us - Mrs. Moon (Twickenham), Stitch Up (Wimbledon Park), Fringe (Muswell Hill) and the brand new Wild & Woolly (Clapton). We are so excited to have them joining us! Over the next few weeks we will profile each shop to give you a few more details about what they have to offer. We hope you'll enjoy visiting them! The inclusion of four more shops means we are offering more routes then last year's edition. One of the consistent themes from the feedback we got after GLYC 2013 was that the groups were a bit big for some of the shops - this year, each route will have a maximum of 10 participants (plus two volunteers). Don't worry - we're going to have nine different routes available, so you'll have plenty to choose from and there will be room for everyone! Nine routes also means we're going to be looking for more volunteers, so if you're interested in being a route leader, please let us know by emailing us at greatlondonyarncrawl@gmail.com with the subject line "2014 Volunteer". One of us will get back to you as soon as we can. In the meantime, check our our volunteer job description so that you know everything that is involved in the role on the day - and leading up to the event. More ways to support Refuge! and doing some charity knitting for Refuge to benefit their clients. Looking at our expenses from last year, the travel cards were our single biggest expense. Many of you chose to use your own Oyster cards or have your travel card included with the price of your train ticket so that more money could be donated to Refuge, which is all kinds of awesome. In fact, when we looked into it this year, the savings of getting your travel card with your rail ticket are almost half of what we would pay Transport for London for a travel card for zones 1-4! Our survey results from last year's event also backed this up, with the overwhelming majority of you telling us that you'd prefer to make your own arrangements so that more money raised from the event could go directly to the charity. Thanks to your feedback, you've made this decision an easy one for us and we applaud you all for the support you're showing for this event, and for Refuge! Our second fundraising enhancement opportunity: we will be running a raffle at the Pom Pom Quarterly after-party for a very special prize basket chock full of yarnie goodies from our sponsors. There will be a number of ways to get your name in the pot, including some charity knitting opportunities. We are really looking forward to this year's Yarn Crawl, and we know it's going to be bigger and better then last year! Stay tuned here, on Twitter, on Facebook and on the Ravelry board for updates, and don't hesitate to give us a shout with any questions. We can't wait to see everyone in September!